FORGET Rousey versus Holm, the UFC feather weight title fight between Conor McGregor and Jose Aldo had perhaps one of the spiciest build ups in the octagon’s history. But it was all over in just 13 seconds. The fighting Irishman spent the past few months touting how he was going to wreck Aldo – who had not been defeated in 10 years before the weekend’s soul destroy fight. After the massive build up, it was a remarkable scene, the fight beginning and ending almost as quickly as you could meet. After the fight was started by referee John McCarthy, McGregor and Aldo met in the centre of the octagon, McGregor the first to strike out with a left that failed to connect with any significance. 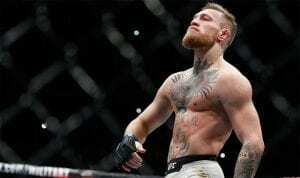 Aldo then roared back with a right and then a big left hook, which unfortunately ended with the south paw McGregor’s fist in his face, the Irishman’s vicious counter leaving the Brazilian seeing stars. Aldo did manage a glancing blow on McGregor as he fell, but this fight was over before his head hit the floor. 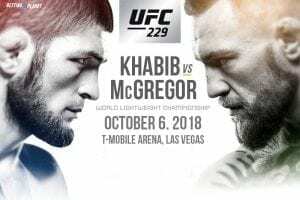 Not that they were needed, but the speedy McGregor swooped, standing over Aldo and finishing him off with a pair of big hammerfists after he fell to his back, the referee diving between the two warriors swiftly. It led to jubilation from McGregor, who climbed the cage at Las Vegas’ MGM Grand Garden Arena, beating his chest. “Nobody can take that left-hand shot,” McGregor said, following the fight. “He’s powerful and he’s fast, but precision beats power, timing beats speed. “That’s what you saw there. Aldo, once he recovered, spoke through a translator, who botched his words, relaying that he said “it wasn’t a fight”. But here is the cleaned up version. “He threw a straight to my chest, I was expecting it, and when I went to attack him he hit a good straight,” Aldo said. “And then it landed there, but I think this fight here… I think now we have to go to a re-match, I think it doesn’t end there. McGregor had spent the best part of the past year baiting Aldo, calling him pretty much every name under the sun and polarising UFC fans with his bravado and blatant disrespect for the champion as the fight build up went on a world tour. “It didn’t affect me in any way, man,” Aldo said of the abuse. “He may have spoken whatever, I never fall for provocations, I stay with a clear head in there, man. “I have to get in there and do my job. “If it’s God’s will I’ll come back stronger and conquer the belt for you. 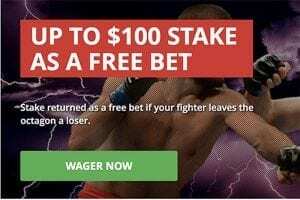 Our friends over at Sportsbet.com.au are predicting the notorious McGregor’s rise to the top of UFC is expected to last much longer than the 13 seconds it took him to dispense of Jose Aldo. The bookie has made McGregor the $1.53 favourite to win a re-match with Aldo and $1.44 to put Frankie Edgar away, should he be the chosen opponent for the cocky Irishman’s title defence. Sportsbet are also taking bets on who McGregor will face at an expected homecoming in Croke Park, Dublin, with Edgar the $2.25 favourite ahead of a Aldo rematch at $2.87. 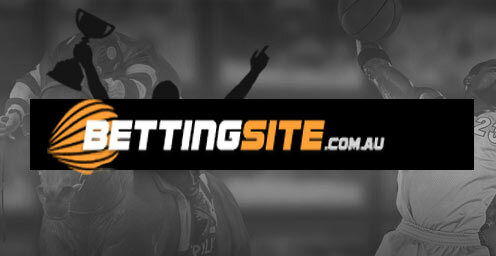 “The most anticipated fight in UFC history, blink and you’d have missed it,” Sportsbet’s Will Byrne said. He will certainly be the favourite against whoever he faces, but at what weight division will that be? And could he hold belts at two different weights? 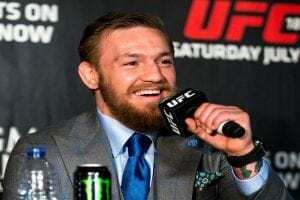 UFC president Dana White thinks so, saying he would let McGregor move up and fight immediately for the 155 pound belt, something that rarely happens in the UFC. “I think that was always his plan,” UFC president Dana White told SportsCenter. So he’ll either do that, or face Edgar in defence of his feather weight title. McGregor says he’ll be taking his feather weight title with him if he decides to go on a path to the light weight belt, saying he won’t be vacating. “I’ll tell you one thing that won’t be happening,” he said. “If I go up to that light weight division, there’s no way in hell that I’m vacating my belt. “There will be a belt on one shoulder and a belt on the other. Only two men have previously held belts in multiple divisions – Randy Couture and BJ Penn – but neither of those men held them concurrently. “Look how many fights I’ve had in the last year,” the prodigious McGregor said. “So when I go to light weight and take that light weight belt, I will stay the feather weight champion also. “I will be a dual weight champion. “There is no going up and vacating. Who would McGregor fight for the light weight title? Hot on the heels of the weekend’s feather weight fight, light weight champion Rafael Dos Anjos will make his title defence against Donald Cerrone. And whoever wins that, might have to deal with Notorious next. White would not commit on McGregor fighting the winner of the bout. Edgar is an intriguing proposition. The former light weight champ is widely tipped to be next in line for a crack at the feather weight title after he smoked Chad Mendes. And he wants a crack at McGregor. “Maybe he’s got one more fight at 145 before he goes to 155,” Edgar said. McGregor, as always, was typically confident. “I like Frankie,” McGregor said. “He fights with his heart. “He had a good run in the light weight division. “Again, he wouldn’t take my shots. “It would not be a good night for him. Inconsolable after the fight, Aldo, 29, will have some soul searching to do. But the Brazilian – before his brutal beating – was regarded as the best pound for pound fighter in the UFC, so you can expect him to take some time to rekindle the fire and then bounce back with a vengeance. Should McGregor go on a path in the next weight class, it might be Aldo who takes on Edgar. White has already hinted at the potential fight. “I don’t think he (McGregor) wants to make 145 anymore,” White said. “I think he’s looking to move up to 155 pounds. “Obviously, if that happened you’d probably do Edgar vs. Jose Aldo for the title. Aldo said he was still coming to terms with his defeat at the hands of the brash Irishman. “It still is too hard to digest,” he said. “We trained hard, did everything right, and the result wasn’t positive. “It takes a while for us to digest, but it’s part of the sport. He said 13 seconds hardly qualified as a fight and that perhaps McGregor was fortunate he made a mistake. “So, there wasn’t even a fight, right? Only 13 seconds,” he said. “And I also remember when I came in, how I tried to punch. “But, man, it’s hard to say now if it’s his success or my mistake. Aldo would prefer a rematch with McGregor over a bout with Edgar, but nothing is set in concrete. “Of course, I want a rematch, and I think I have this right,” he said. “Not only me, but my career speaks for itself. “We will come out victorious, for sure. “It’s a sport, we have to accept. “Not only from wins you live your life. We wouldn’t doubt his ability to do so and we really hope there is a rematch on the cards between the pair. McGregor mania is sweeping the world, but his home grown fans are undisputedly loyal – and plenty of fun. He celebrated with those fans after the fight, turning the Vegas strip “green, orange and white” and says his fans are the best in the UFC. “I’ve been soaking it in all week, at the weigh-in I wanted to stay on the stage, I smiled and I took it in,” he said. “The Irish fans, you can’t beat them. Whatever happens, McGregor, the former Dublin apprentice plumber, might have just overtaken Ronda Rousey as the UFC’s most bankable star, after the 13 second fight set a gate record. He is set to earn some $16 million for the fight – about $1.3 million for each second of the bout. And he’s certainly become a serious cash cow for White, with the gate netting some $10.1 million and the number of pay per view buys tipped to eclipse $1 million. “I’m bringing these big numbers and the sky is the limit,” McGregor said.